When I jumped on the pin-making bandwagon a few months ago I noticed there's a deficit of classic film related enamel lapel pins on the market. I scoured the internet to find as many as I could and collected them here for a little Christmas shopping/wish list kind of post. I already have the Gone with the Wind pin (#17) and I ordered the Hitchcock one the minute I laid eyes on it (#11.) A few pins were designed by me, but most of them are from other artists. Honestly this was all I could find on classic movies, which kind of bummed me out! If you have any suggestions or ideas for a pin that you'd love to see exist let me know in the comments and I'll try to make it happen! 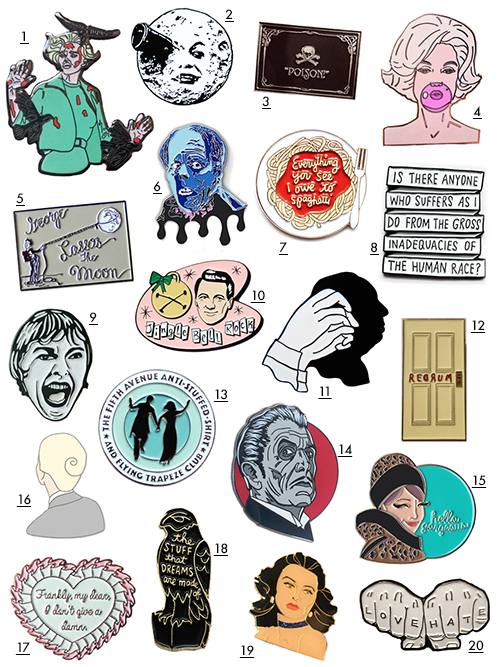 I really like your pins from Vertigo & The Maltese Falcon. I would love to see do some more themed pins from these two films. Also, it would be awesome if you could do an Audrey Hepburn pin from Sabrina. I really love that movie! I would love something Fred and Ginger! I'm amazed I haven't found a pin about them yet. Great collection here! I just bought three of your movie pins and I can't wait to get them. That Rock Hudson one is definitely going on all of my sweaters this holiday season. @The Third Man Thank you for letting me know! I just updated the link. Hi there! I'm Kate Gabrielle -- artist, classic film fan, Francophile, and Alain Delon fangirl.